Alverno College students work in a class lab led by biochemistry professor Heather Mernitz. 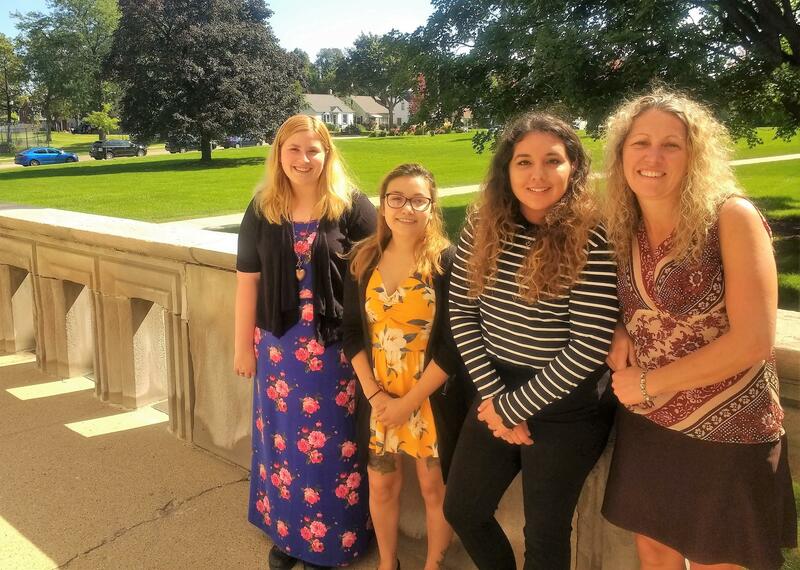 (From left to right) Carissa Babcock, Amorina Cruz, and Elizabeth Gamillo are first-generation college students and STEM majors at Alverno College. Angela Frey (right) is a biology professor who leads Alverno's STEM program. WUWM's Emily Files reports on what one Milwaukee college is doing to help low-income women enter STEM fields. This year, the women's college received a grant of roughly $1 million from the National Science Foundation to support its New Futures program, which helps low-income, high-performing women earn STEM degrees. “If you look at who is underrepresented in the STEM fields, in many STEM fields it’s going to be women. It’s going to be students of color and low-income students. And those are the students that we serve at Alverno,” said Angela Frey, Alverno STEM program director. The goal of the New Futures program is to increase enrollment and graduation rates for STEM majors. Right now, less than one in 10 Alverno undergrads is on a STEM track. And of those who are, about half make it to graduation. But students who received support through a previous iteration of the New Futures program graduated at a much higher rate. Amorina Cruz is an example of the kind of student the new grant would help. She’s a low-income, first-generation college student who made her way to Alverno without a lot of help from her parents. “They didn’t know anything about college, so I was kind thrown into it myself,” Cruz said. She's now a senior biology major. The New Futures grant money will pay for scholarships, mentorship and community-building activities. It will also subsidize work experiences, like internships, for students who might not be able to afford them otherwise. “It gives some financial relief so that they can pursue opportunities that may be lower-paying but gives them the professional experience they need to go to grad school or get that job in STEM,” Frey said. Those experiences give students a taste of what it will be like to work in their chosen field. The internships aren’t always easy for women or low-income students. Cruz says when she interned at a grad school research lab, she felt like her co-workers didn’t respect her. “Sometimes I didn’t feel like an equal with them, even when we were working side by side,” Cruz said. Frey says if STEM workplaces don’t become more inclusive, innovation will suffer. Alverno can help clear the way for students like Cruz, but the school can’t do everything. Cruz’s dream is to be a veterinarian. But she says vet school is too expensive. Instead, she plans to pursue a career in genetics, molecular biology or cancer research. Lake Effect's Mitch Teich interviews Beth Akerlund, managing director of the Milwaukee Chapter of Girls in Tech. A Milwaukee area group forms to attract girls and women to technology fields. We’ve done quite a few interviews over the years on Lake Effect about where education in the STEM fields - science, technology, engineering, and math - fits in the 21st century economy. In particular, there has been a concerted effort to attract more girls to the field, so that someday there will be more women in engineering and tech fields.